In this video we will discuss, creating a view to insert a new employee into the database table tblEmployee. Please watch Part 11, before proceeding with this video. Copy and paste the following "Create" action method, in EmployeeController class. Please note that, the method is decorated with "HttpGet" attribute. This makes this action method to respond only to the "GET" request. 1. View name = "Create"
2. View engine = "Razor"
At this point "Create.cshtml" view will be added in "Employee" folder. If you have the following "Scripts" section at the bottom of the view, please delete it. We will discuss about sections and scripts in a later video session. 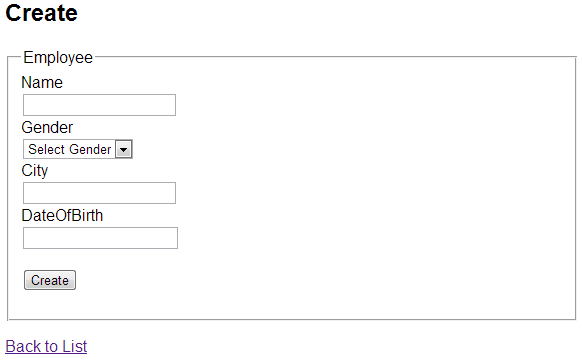 Run the application and notice that, a dropdownlist is now displayed for "Gender". If you click on "Create" button, you will get an error message stating - The resource cannot be found. This is because we don't have the "Create" controller action method that can handle HTTPPost request. We will discuss, fixing this in our next video. you have told that you will discuss about sections and scripts in a later video session i have watched all your i have learned many things from your videos think you missed where to use this scripts can you do this..! Use a @Html.Hidden helper in the view page with an html attribute of id/name ="X" and then within the controller, consider an input parameter of "X". This "X" will contain the posted form values. In this tutorial when we click on "Create" button, its going to execute "Create" action method in "Employee" controller. But when I had a look on "Create.cshtml", the html code for "Create" button as like below. First I thought, because as we are specifying value = "Create", its calling "Create" action method in Employee controller. But even we are changing the value to something else like as "CreateEmployee", still its calling same "Create" action method. Could you please give some explanation for this. "CreateEmployee" is the name printed on the button(not the action name).